Cardinal symptoms: Unilateral or bilateral enophthalmos (recession of the eyeball within the orbital cavity) or exophthalmos (protrusion of the eyeball) are characteristic of many orbital disorders (Table 15.2). These conditions should be distinguished from pseudoexophthalmos due to a long eyeball in severe myopia, and pseudoenophthalmos due to a small eyeball, such as in microphthalmos or phthisis bulbi. The following list of examination techniques begins with the simple standard techniques and progresses to the difficult, more elaborate methods. As a general rule, orbital disorders require interdisciplinary cooperation between ENT specialists, neurologists, neurosurgeons, neuroradiologists, internists, nuclear medicine specialists, and oncologists. Visual acuity: See Chapter 1. Ocular motility: The pattern of disturbed ocular motility can be a sign of the cause of the disorder. Causes may be neurogenic, myogenic, or mechanical (see Chapter 17). 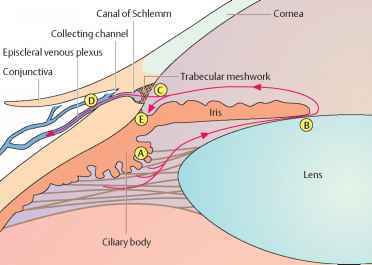 Examination of the fundus: Retrobulbar processes can press the globe inward. This often produces choroidal folds that are visible upon ophthal-moscopy. Compression of the optic nerve by a tumor may result in optic nerve atrophy or edema. Meningiomas in the sheath of the optic nerve lead to the development of shunt vessels on the optic disk. 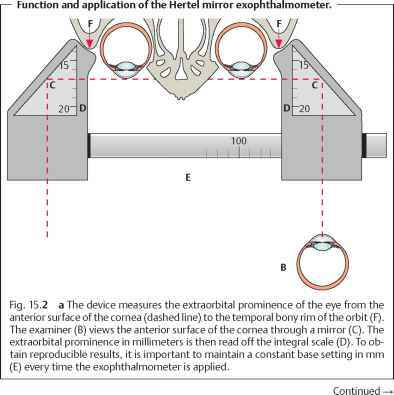 408 15 Orbital Cavity — Function and application of the Hertel mirror exophthalmometer (continued). Fig. 15.2 b The exophthalmometer is placed on the lowest point of the temporal zygomatic. To avoid parallactic measurement errors, the examiner moves his or her own eye horizontally until the two integral graduations (black arrowheads on the right) align in the projection (black left arrow). Once the graduations are aligned, the examiner reads the value of the extraorbital prominence of the anterior surface of the cornea (long white arrow) on the scale (short white arrows). The examiner reads the measurement with only one eye. 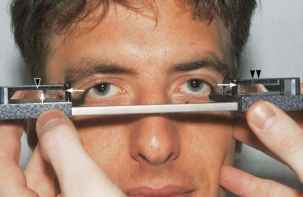 The examiner uses his or her left eye to read the value for the patient's right eye and vice versa. change in the position of the globe with respect to the orbital rim is a cardinal symptom of many orbital disorders (see Table 15.2). The difference between thetwo sides is more importantthan the abso lute value. A difference greater than 3 mm between the two eyes is abnormal. Unilateral exophthalmos is recognizable without an exophthalmometer. To do so, the examiner stands behind the patient, slightly lifts the patient's upper eyelids, and looks down overthe patient's forehead toward the cheek. Visual field testing: This is used to document damage to the optic nerve in orbital disorders. Ultrasound studies: Two techniques are available for this noninvasive examination. 1. The B-mode scan (B stands for brightness) provides a two-dimensional image of orbital structures. This examination is indicated in the presence of suspected orbital masses. 2. The A-mode scan (A stands for amplitude) permits precise measurement of optic nerve and muscle thickness. This examination is indicated as a follow-up study in the presence of Graves' disease (endocrine orbitopathy). 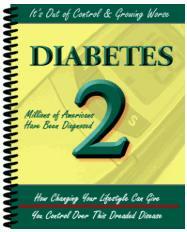 These studies may also be combined with Doppler scans to evaluate blood flow. Conventional radiographic studies: These studies usually only provide information about the nature of bone structures, i.e., whether a fracture is present and where it is located. Smaller fractures often cannot be diagnosed by conventional radiography and require CT scans. Computed tomography and magnetic resonance imaging: These modern examination modalities can precisely visualize orbital structures in various planes. They are standard methods for diagnosing tumors. H In the presence of orbital trauma, initial CT studies should be performed as this method can better visualize bony structures. Initial MRI scans should be performed where soft-tissue lesions are suspected. Angiography: This is indicated in the presence of suspected arteriovenous fistulas. How to use hertel exophthalmometer for measurement of proptosis?